Guy Kawasaki (@guykawasaki on Twitter), best-selling author of The Art of the Start and Reality Check, is changing the world . And while I can’t say I always agree with his politics, I sure do love his creativity and what he brings to the world wide web. Last year he launched Alltop (inspired by popurls), a site described as an online magazine rack . Simply put, it’s a site that aggregates, in a very clean and simple way, the web’s cream of the crop from virtually every topic imaginable. There’s plenty of useful information to be found on Alltop, not the least of which is great blog post ideas. You’ll find links to blogs and news sites on topics ranging from Acne to Zoology and virtually everything in between. Don’t find what you’re looking for? Suggest to the Alltop crew they add it by sending them an e-mail to info@alltop.com. You can even submit your own site or blog for inclusion among the topics. My blog shows up in the radio category. Alltop isn’t for you or me. It’s for friends and family and coworkers who aren’t yet surfing at the speed of light with Google Reader, or adding meta commentary via FriendFeed. It’s for our neighbor who still logs into AOL, or people who want to read a sampling of information without a lot of customization. Now, I consider myself a seasoned surfer, but I find myself often making use of Alltop anyway. Rather than doing a Google search when I’m researching a particular topic, I go to Alltop first to see if it’s covered there. If so, I instantly have a dozen or more of the top blogs on that subject at my fingertips. Are you a Mom interested in what others in your space are writing about? Then moms.alltop.com is a good place to start. Want to learn how to make a Caramel Machiatto just like Starbucks? Try coffee.alltop.com. Looking to hone your writing skills? Check out writing.alltop.com. Whether you’re an internet newbie or a seasoned pro, I think you’ll find plenty of benefits at Alltop. What about you? Can you think of other ways to use Alltop? Why Are You Thumbing Your Nose At Twitter? 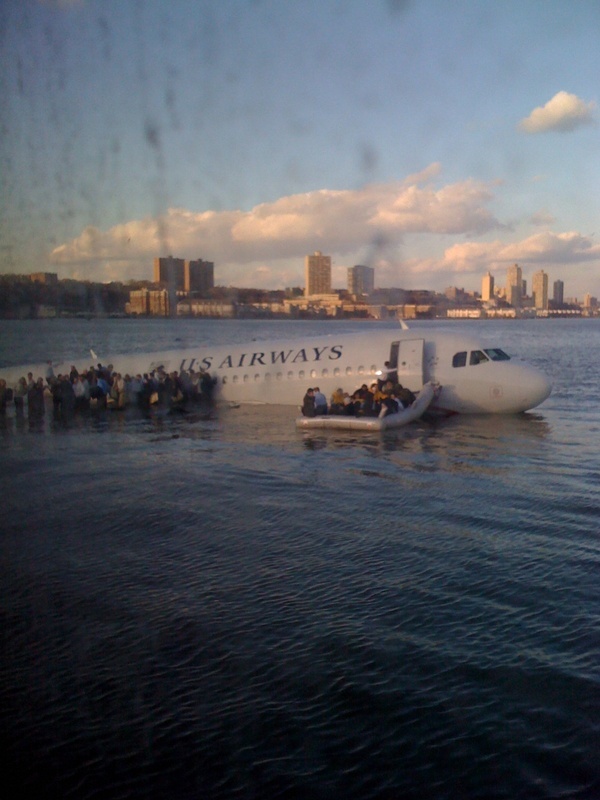 As you’ve no doubt heard, earlier today a US Airways flight, in a losing fight with a flock of geese, ended up in the Hudson River. Miraculously, not one of the 155 passengers or crew was seriously hurt. You may have noticed, if you watched the news or read about it online, that one particular photo continued to turn up just about everywhere. Passengers stand on the wing waiting for their turn. The image was taken by Janis Krums on his cell phone which he then uploaded to TwitPic, a Twitter client that makes it easy to broadcast, or “tweet,” your photos. You send a picture mail to TwitPic and it automatically syncs it with your Twitter account, broadcasting a message (or tweet) based on what you put in the subject line of your picture mail, along with a shortened link directly to the image itself. Twitter, by the way, gives you a maximum of 140 characters to state your message. This afternoon before I left to come home from work, over 40,000 people had clicked that link – just an hour or two after it was taken. At the time I’m writing this (almost midnight) that number has more than doubled. I’m not sure how many followers Janis began the day with (he’s at just over 2100 now), but suffice it to say, some of them “Re-Tweeted” (RT) or forwarded the above tweet, sharing it with their followers as well. In fact, before today, I’d never heard of Janis, but one of my followers mentioned the image and the link and before I knew it, I was “tweeting” about Janis and his snapshot to all of my other followers as well. 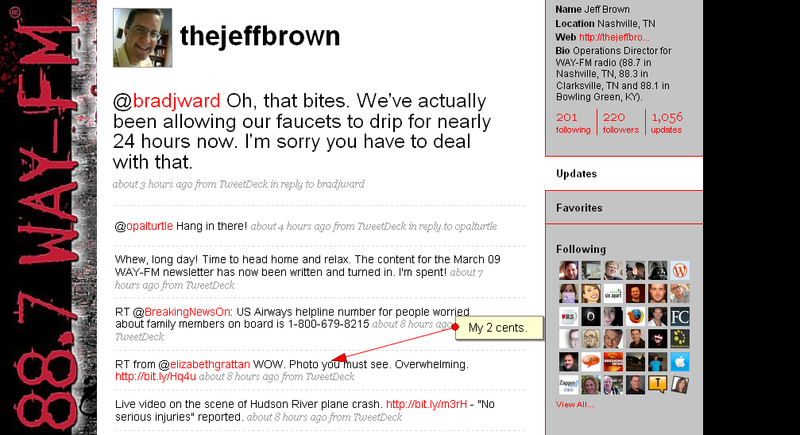 It is utterly amazing to me how fast this kind of thing can move on a platform such as Twitter. I even heard Janis being interviewed on CNN, made popular, no doubt, by his now widely-seen photograph. According to his twitter page, he’s on MSNBC next. What can you say in 140 characters or less? Can you be effective with less words? There is no room for wordiness. You need to be on point with your message as quickly as possible. I don’t know about you, but I think he followed his own advice pretty well. I wonder how many people are twittering? I guess this will have jumped the shark when I see a sitcom episode around it. For a great example of one company’s use of Twitter, check out @comcastcares. Their approach may not apply to your industry in every way, but I’ll bet you still find plenty of take aways.